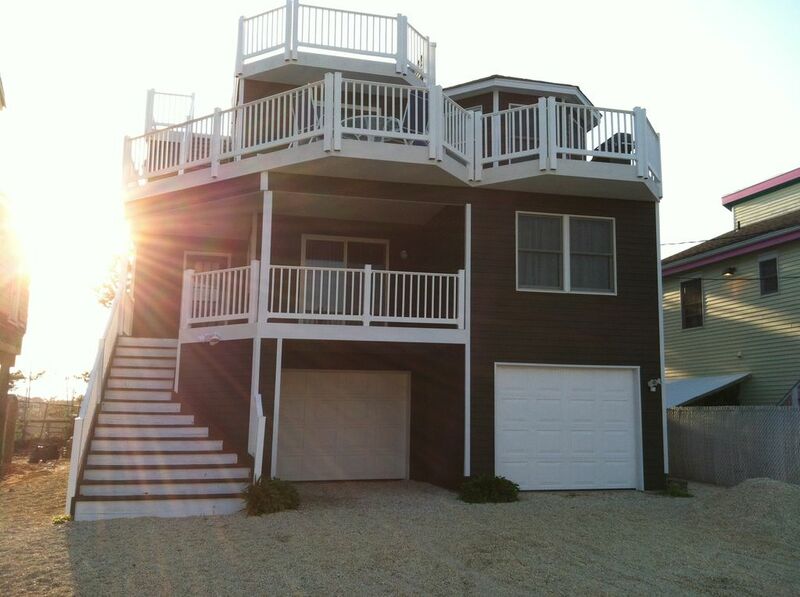 Quiet yet convenient location near southern tip of LBI features beautiful ocean views from both the multi-level decks as well as all front-facing rooms. Watch the sunrise and sunset from the awesome private oversize rooftop deck - offering panoramic views of the ocean, bay and Atlantic City. Upper and lower master bedroom suites and upper and lower living areas make this home ideal for large/multi family gatherings. Lower-level living area features a living room with TV, wet bar and small refrigerator, washer & dryer, full bath, master bedroom suite with its own full bath plus 2 additional bedrooms. The upper-level has a large master bedroom suite complete with cathedral ceiling, king-size sleigh-bed, ceiling fan, TV and spacious private bath with dual sinks and oversized walk-in shower with dual seats. The open floor-plan features a beautiful fully-equipped modern kitchen that flows into a large dining room, living room with fireplace and TV, and sliding doors to outdoor multi-level decks with BBQ grill and full complement of deck furnishings. Enjoy the ocean views from the living room, dining room or decks. Great for entertaining! Steps to beach or bay. Ample parking and garage. Quiet residential area, yet close to all activities. There's a park directly behind the house with a playground, ball fields and a roller-hockey rink. Kids: bring your skate boards and roller-blades! A bike path directly outside our front door runs the entire length of the island. Bike rental shop nearby. Sorry; Pets are NOT allowed. No prom or graduation parties. Off-season week/weekend rates available upon request. Please call or write for more info. 1. 2 Living Rooms! Perfect for entertaining or families with kids who want their own space. 2. Beach Haven Park directly behind house! 3. Ocean and bay within short walking distance. Downtown Beach Haven, including Bay Village and Fantasy Island, is about 1 mile north. Views of ocean and bay. Beach is across the street less than 100 yards away and can be seen from all decks and front-facing windows. Bay is about 1/4 mile and can be seen from the roof-top deck. Pillows, blankets and kitchen towels provided. Bring your own bed sheets and bath towels, or they can be rented locally. We can assist with this. Upper and lower living room entertainment areas. (2) Full-size refrigerator in kitchen. Wet-bar in lower living room contains sink and additional small refrigerator. Dining area also includes additional bar-height dining table with 4 bar stools. Kitchen has tiled peninsula prep and breakfast type eating area with 2 bar stools. Several golf courses within short drive.